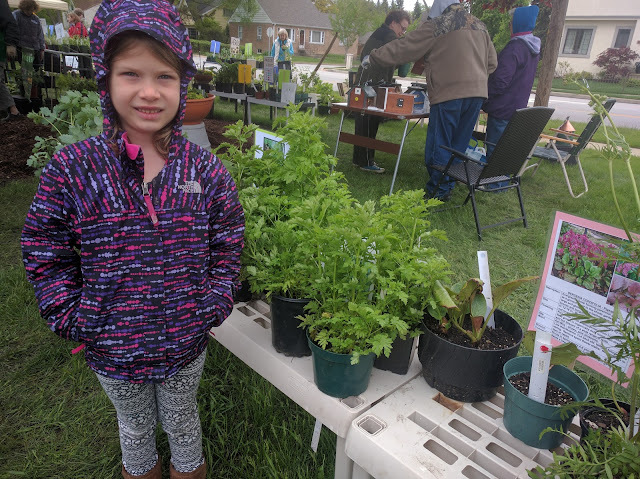 Over the weekend, we stopped by the Crestview Garden Club Annual Plant Sale on St. Charles Road by York High School and despite the weather (it was cold!) we wandered through the selection and picked out a few plants. I wrote about the same plant sale three years ago here on the blog. This time, shopping was a little different because we don't have our own house right now. So...we were there to buy some plants, but with a mind of either planting them to add something to my sister's yard or something that we can plant in Nat's Mom's garden with the hope of being able to transplant them next year or beyond. I went there seeking out a fern that I could plant here in Elmhurst and came away with two ferns: one for my sister's yard (the one on the right) and one that we'll plant in Naperville (on the left). 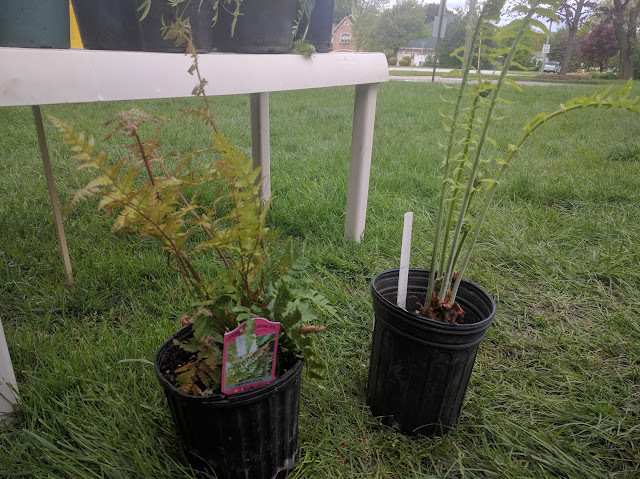 The one on the right is listed as a 'Cinnamon Fern'. Which...I think I've confused with Ostrich Ferns! This is a pretty profound moment here for me: have I been wrong about Ostrich Ferns this whole time? Just look through the archives here. I've written about them a lot. But, have they always been Cinnamon Ferns? Either way...I'm hoping that this one will take root here in her shade bed on the south side of her backyard and eventually reproduce like the other ferns I've had. Wouldn't that be a nice surprise to come home from Switzerland to in your yard? A bunch of beautiful ferns?!?! I also bought a miniature hosta variety that can grow *in the ground* and not required to be in a pot. I'll post about that later and include a photo, but I'm thinking that one will go off to Naperville, too.